I'm using Affinity Photo with my Wacom Pen and Touch and the pen pressure is not working as expected. When pressure button is pressed the size of the brush varies, but the dynamics panel (that shows up within "More" settings) seems not working at all. I've probed to ajust to "Pressure" several options, but there's no visible results. Am I doing something wrong, or the pressure just works with brush size? Hi, can you share a screenshot? I think I have the same problem. I'm in AP > brush > more > set everything on Pressure > and still no pressure sensitivity. What am I doing wrong? Your size jitter is completely set to zero which means no pressure sensitivity. 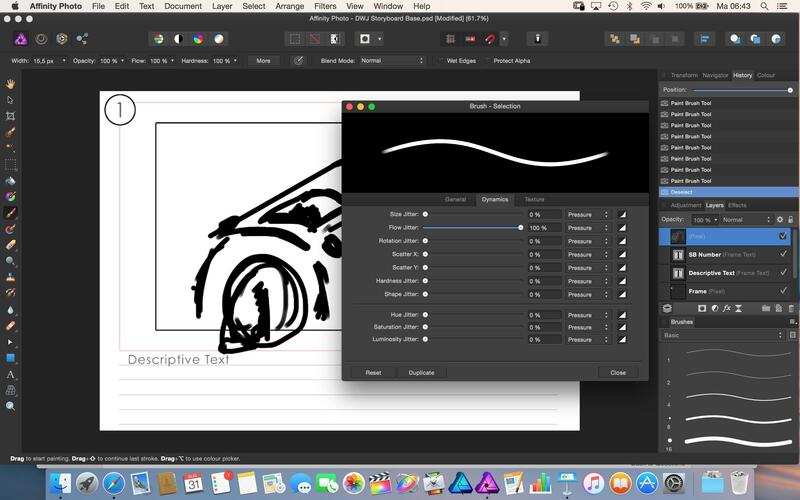 Slide it to the right to start getting some pressure (size) variance on your brush strokes. Same goes for all.